The Quinnipiac Bobcats (7-6-0, 3-3-0 Eastern College Athletic Conference) defeated the RPI Engineers (4-6-2, 2-1-1 ECAC) in the second of their two conference game this weekend. Quinnipiac entered their second game of the weekend coming off a 4-3 overtime win against Union, which got them back in the win column after two tough road losses a weekend ago. Meanwhile, RPI began their weekend with a 2-1 win against Princeton, giving them their first win of their four-game road trip ending in Hamden. The Bobcats came out strong in the first ten minutes, but were countered by a strong second ten minutes by RPI. Quinnipiac, who took the first four shots of the game, spent much of the first ten minutes controlling the pace of the game and saw a couple of great scoring opportunities as a result. Unfortunately, they were unable to convert on any of those chances. RPI battled back into the game creating a few of their own scoring chances culminating in two point blank shots from the slot that were stopped by Abby Ives. The teams headed to the locker-room locked in a 0-0 battle with shots tied at six a piece. After a tough last ten minutes of the first period for the Bobcats, they came out in hungry in the early goings of the second period. Much like in the first period, their offense seemed to be clicking early and they had a couple of nice scoring chances. A hooking penalty sent RPI’s Aimee Raithby to the box and gave the Bobcats a golden opportunity to break open the scoring. A few seconds after the power play ended, Taylor House did just that. She collected a rebound from teammate Raquel Pennoyer and beat Lovisa Selander through the five-hole to give the Bobcats a 1-0 lead with 13 minutes left in the period. After the game, Quinnipiac Head coach Cassandra turner spoke about the Impact that House has made on the Bobcats. “She’s a big strong player who has a presence and it’s nice to see her continue to grow,” Turner said. Quinnipiac continued to push the pace and keep shooting in an attempt to put the game out of reach. However, momentum shifted once again when Quinnipiac was sent to the penalty kill twice in a span of four minutes late in the period. Quinnipiac successfully killed off both penalties and it looked like they would take a 1-0 lead into the second intermission. 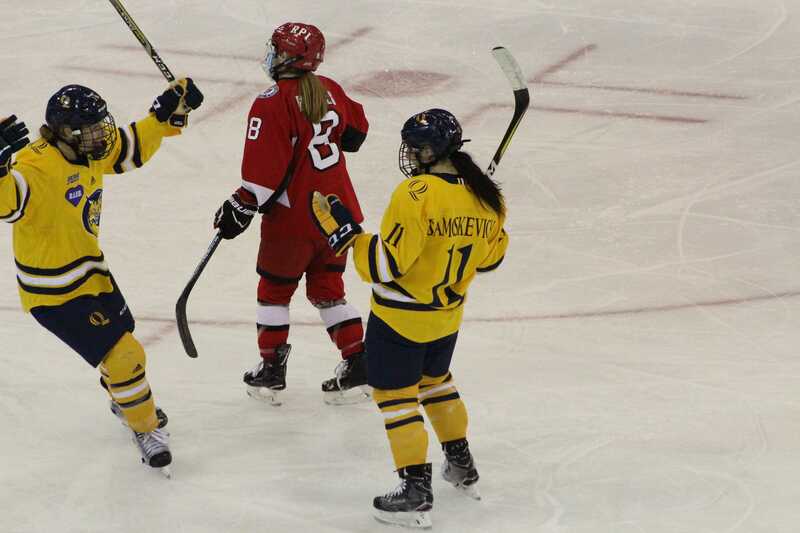 That was until RPI’s Jaimie Grigsby broke down the right side beating Quinnipiac’s defense and lifted a shot over the right shoulder of Abby Ives, tying the game with 18 seconds left in the period. “It’s not okay to give up goals in that time frame of the game,” Turner said. The third period began with both teams going up and down the ice with quality scoring chances on both side, but after ten minutes the teams remained tied. Both goalies, Ives and Selander, made some great saves to keep the game tied at one, headlined by an Ives glove save on another quality scoring chance by Grigsby in the slot and a 2-on-1 stop by Selander on Pennoyer and Mackenzie. It appeared that neither team was going down without a fight and a goal might be hard to come by. Finally, The Bobcats broke the tie on a goal from Melissa Samoskevich with just over 10 minutes left in the game. Katie Lancaster won a puck battle in the corner and found her teammate wide open in the slot. That was all Samoskevich needed as she beat Selander low blocker side to put the Bobcats up 2-1. The Engineers didn’t go quietly though as they battled back and drew a late penalty on a hook from Kati Tabin giving them one last chance to tie the game. The Bobcats successfully killed off their fifth penalty of the night to close out the game, giving them their second win of the weekend. Quinnipiac will look to win its third straight game next Friday at 6 p.m. when they take on the third ranked Clarkson Golden Knights (10-1-1 overall, 3-1-1 ECAC) at Cheel Arena in Potsdam, New York.